King Louis XIV of France decided to adopt a plan to establish a better foothold in the new North American Colony of Quebec. The King's plan was to encourage single or widowed young women to go to Quebec, marry one of the single or widowed Frenchmen there, raise a family and establish themselves as permanent colonists. Compared to France the New World was harsh, with the lack of amenities, the danger from the Indians, harsh winters and its isolation. 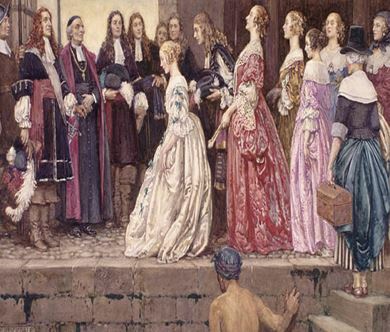 The cost of sending each Filles du Roi to New France was 100 livres: 10 for the recruitment, 30 for clothing and 60 for the crossing itself --the total being roughly equivalent to $158.00 today. As an incentive to enlist, the young women were to be awarded a dowry of from 50 French pounds up. (About $79.00 in today’s dollars) The Royal treasury provided the necessary funds and was fully supported by King Louis XIV of France. Thus, due to this support, these recruits came to be called “Les Filles du Roi”, or "The Kings Daughters" in English. In France, parish priests announced the King's program from the pulpit in an attempt to recruit eligible young women to leave France and travel to the New World. The young women were told they would be doing "a good service for God and their country" to go to this primitive land and marry the single men of Quebec. The Filles du Roi candidates were carefully picked by agents of the King of France for their good qualities. Records indicate many had good backgrounds, some with good educations; some had money from inheritances; yet others with little or no education. Some came from upper middle class families, but for the most part, they were poor peasant farm girls who had very little education and could neither read or write. For a period of seven years, the King of France sent at his expense, several thousand young women to New France, the recruiting of Filles du Roi took place in Paris, Rouen and other northern cities of France. Each had to present their birth certificates and a recommendation from their parish priest or local magistrate that she was free to marry. A few women came from other European countries, including Germany, England, and Portugal. For some women who were orphans or had no financial prospects, it was a chance for a better life. In those days a woman without parents or who was poor had no dowry. Without a dowry, they could neither marry nor become a nun in the church. Their only option was a life of servitude. The chosen were held to scrupulous standards, which centered on their "moral caliber" and whether they were physically fit enough to survive the hard work demanded by life as a colonist. In fact, several of the filles du Roi were sent back to France because they were judged not to satisfy the standards set out by the King and the intentions of France. Those chosen were provided their cost of passage from France and each received a hope chest with personal items which also included practical items, thread, needles, pins, comb, scissors, knives and some cash, among other items. They were provided suitable clothing and provisions upon their arrival in Quebec. Most remained in Quebec, while the remaining were sent to Montreal and Trois-Rivieres to meet the eligible bachelors in those areas. After a perilous and uncomfortable journey across the ocean with an appointed chaperone, they reached Quebec. When the Filles du Roi arrived, they were taken in by Sister Marguerite Bourgeoys, the religious founder of La Congregation of Notre-Dame. Initially, there were no comfortable lodgings to receive them, but in 1668 Sister Bourgeoys procured a large farmhouse in which to house them called the Maison Saint-Gabriel. Upon their arrival in Canada, the women received room and board until they were married. She and her four assistants were also responsible for interviewing the many bachelors that came seeking a wife at her order's office at Maison Saint-Gabriel. "Instead of the 50 that your dispatch had me hope for, 84 young girls were sent from Dieppe and 25 from La Rochelle. There are fifteen or twenty from quite good families; several are real young ladies and quite well brought up…"
​In the year 1663 one of those answering the call for young women to sail to Canada from France as a prospective bride was Marguerite Gaillard, age about 27 years, the widow of Hercule Duperron. Hoping to start a new life in Canada she brought along her possessions worth about 200 Livres in addition to the dowry provided for the Filles du Roi by the French Crown. Shortly after arriving, in July of 1664, she married Francois Provost, again widowed, she married Louis Charles Saucier and became the modern day mother of all Saucier families in North America. Their long voyage from France must have been quite difficult on the recruits. In 1664, the Conseil Souverain reported to the French minister for the colonies, Jean-Baptiste Colbert, that sixty of the 300 people who embarked at La Rochelle the previous year, 1663, had died at sea before reaching Canada. Of the over 1000 recruits, during the early years, who signed up to make the journey, only about 800 made it to Canada. After arriving, these young women had a period of time in which to choose a husband, after which time those who remained unmarried could return to France or remain in Quebec. 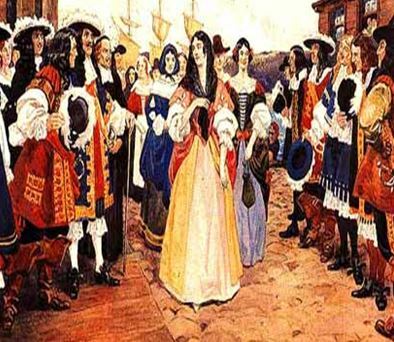 ​Of those that arrived in Quebec as Fille du Roi's from the inception to the end of the program in 1673, there were approximately 300 recruits who did not marry in Quebec. Some had changes of heart before embarking from the ports of Normandy and did not make the journey, some died during the journey, some returned to France to marry, and a few never did marry and chose to just remain in Canada. Every Filles du Roi had the right to refuse any marriage offer that was presented. In order to make an informed decision to accept a would-be husband, the girls asked questions about the suitor's home, finances, land and profession. Having a home of one's own was one of the most important considerations for a Filles du Roi. "The smartest among the possible suitors began constructing a home at least one year before getting married, because those with a home could find a wife much easier. It's the first thing that the girls ask about since those who married one of the single Canadians without an established home would suffer greatly before being comfortable." After agreeing to marry, the couple appeared in front of a notary to have a marriage contract drawn up, and the wedding ceremony generally followed within 30 days. For the Filles du Roi, the average interval between arrival and marriage was four to five months, although the average interval for girls aged 13 to 16 was slightly longer than fifteen months. Many made hasty contracts of marriage, only to shortly break them and then make new marriage contracts with another bachelor, trying to make better marriages. In addition to any dowry of goods brought with her from France, each newly married couple was given an assortment of livestock and goods to start them off in married life. They were also rewarded (paid) by additional allotments for the number of children they and their new husbands had. The more children the family had, meant larger allotments for the year. If they had ten children the government gave them a yearly allotment of 300 livres (about $525 in today’s dollars), 400 livres (about $700 in today’s dollars) was given for 12 children; an even larger allotment for 13 or more children was given. This was a lot of money for that period of time. 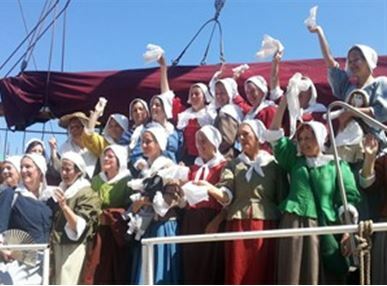 The many young women recruited were in no way related to the King of France, as this was only an honorary title bestowed upon those that chose to make the long sea voyage to Canada to possibly marry one of the single Canadians and Frenchmen living in the new Colony. The title "King's Daughters" was meant to imply state patronage, not royal or even noble parentage. Most of these women were commoners of humble birth. They were also occasionally known as the King's Wards. "Wards" means those under the guardianship of another, in this case the King of France, Louis XIV. There are many contradictory stories about the origins of the chosen filles du Roi candidates. 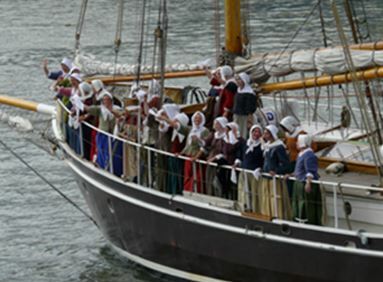 Some stories claim that they were mostly prostitutes who were forced by local French authorities onto ships in French harbors and sent to New France against their will. Other stories claim that these women were mostly recruited by Jesuits who insisted upon accepting only women of the finest moral character. The truth is probably somewhere between these two extremes. About 40 Daughters, called Daughters of Quality (filles de qualité), were from wealthy upper class families and had dowries of over 2000 French pounds. Several of the Daughters of Quality have provable descents from European royalty. In 1672 France and England declared war on the Dutch republic, requiring a great deal of the attention and finances of the French government. The French authorities decided it was too costly to continue sending Filles du Roi and unnecessary since the colonies own population could provide a sufficient number of marriageable women. In September 1673 the last shipment of Filles du Roi arrived from France, and the program ended. Left photo: The Les Filles du Roi girls were sent by King Louis XIV to New France (Quebec) to marry the single men of the colony in Canada. Painting by Charles W. Jefferys. Right photo: Church officials in Quebec and several settlers welcome the King's Daughters upon their arrival. Painting by Eleanor Fortescue-Brickdale.